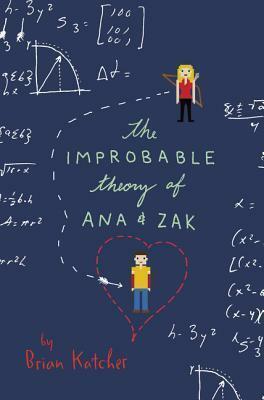 The Improbable Theory of Ana and Zak is Stonewall Book Award-winning author Brian Katcher's hilarious he said/she said romance about two teens discovering themselves on an out-of-this-world accidental first date. It all begins when Ana Watson's brother, Clayton, ditches the quiz bowl semifinals to go to the Washingcon sci-fi convention on what should have been a normal, résumé-building high school trip. If slacker Zak Duquette hadn't talked up the geek fan fest so much, maybe Clayton wouldn't have broken the rules or jeopardized Ana's last shot at freedom from her uptight parents. Now, teaming up with Duquette is the only way for Ana to chase down Clayton in the sea of zombies, bikini-clad princesses, and Smurfs. After all, one does not simply walk into Washingcon. But in spite of Zak's devil-may-care attitude, he may have more in common with Ana than she thinks. Ana and Zak certainly don't expect the long, crazy night, which begins as a nerdfighter manhunt, to transform into so much more. . . .